Silverfish are small insects with no wings. The name is derived from their silver color and fish-like appearance. They may also be called fishmoths, paramites or carpet sharks. Silverfish feed off of book bindings, carpet, clothing, coffee, dandruff, glue, hair, some paints, paper, photos, plaster and sugar. Silverfish also can damage tapestries. Other substances they may eat include cotton, dead insects, linen and silk. Pest Solutions 365 can determine the size of the silverfish infestation and your pest control needs with a professional pest audit. Only $25 for a 20-minute inspection. 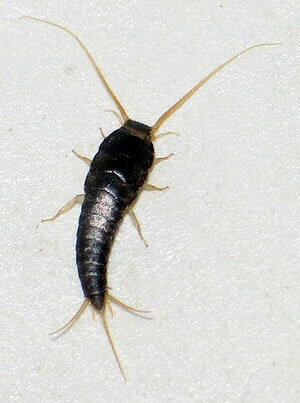 Silverfish live in damp, moist areas. Use a dehumidifier to eliminate these areas in your home. Mend leaking pipes with FixIt leak fixer putty. Leaking pipes provide moisture for silverfish breeding grounds. Keep your home clean and vacuum any cracks or crevices where silverfish may hide. These pests will find another home if you continue to destroy the one they are living in. If you don’t have pets or children, chemical treatments can be used around the perimeter of the inside of your home. Silverfish hate cloves. Putting a whole clove in areas where silverfish are seen will force the insects to move. Walls of areas where silverfish are present can be sprayed with a mixture of two parts water and one part bleach. Bleach and hot water can be poured down drains to kill any of the insects that may be lurking in pipes.